In celebration of receiving our new washer and dryer the hubby and I went to our newest favorite watering hole Coddington Brewery. I see a pattern starting here. 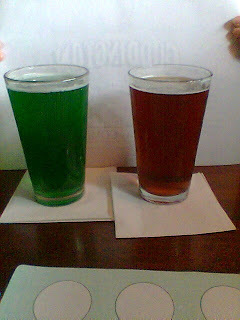 In celebration of St. Patrick's Day they had two special beers Lucky Lager, the green one, and Irish Red Ale (You guessed it the red one.). Both are quite tasty. In fact we got a growler of the Lucky Lager to take home, since it won't be here for long. St. Patrick's Day seems to be a big thing here. Could be because we're so close to Boston. 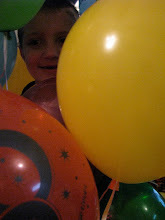 We didn't go to the parade because it was raining and I had a back log of laundry to do. And am still doing. Ah well, back to reality.